Simple steps on how to update or delete data of a table through a GUI applications in NetBeans IDE. 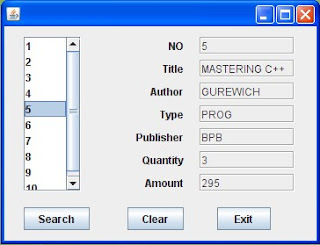 1 First, follow the steps for searching the data through a GUI. 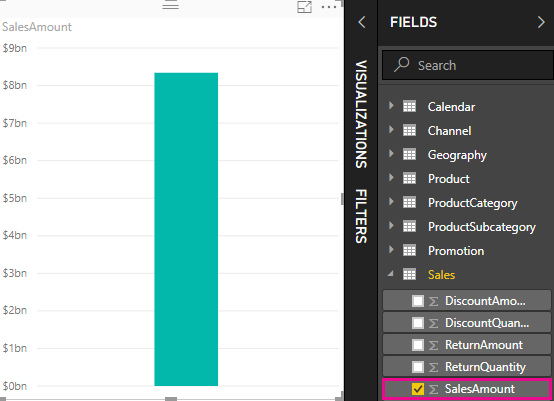 This is to make sure that you are able to bring the data in the text-field for further updation or deletion. 2 Make sure you have made the text-fields as editable. To make them editable, select all the text-fields and right click. Now, select properties and checkmark(if, unchecked) the editable option. 4 To make your program more better you can make the text-fields empty when the user has completed task of updating his table. Also, you can show a Message Box stating that the update was successful. 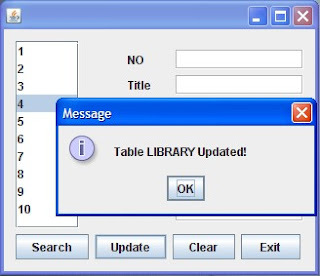 You can see that when a user clicks the update button the text-fields becomes empty and a message pops-ups stating that the table was updated successfully! 5 Now, for deleting a row from a database. Insert one more button and rename it to “Delete”. 7 Here also I have used a JOptionPane to show a message to the user that the row was successfully deleted. 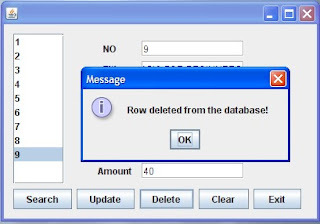 Like the above message, you can also use various ways to make your program effective, example when a user clicks on delete button all the text fields gets cleared and also you can refresh the list to show that the deleted row does not exist any more in the database. Remember to change the codes in blue according to your database and your GUI. Please comment, if you are not able to follow. Add the above code BELOW the line DefaultListModel list=(DefaultListModel) jList1.getModel(); on the Search button. and I wanted to print its content in a jList or textbox for example. how do I do that? Can you post Inserting data code. Thanks,good work keep it up! since i am using Jtable to list my data, i changed the jlist1 to jtable and i am getting error on "getSelectedValue" please help. where row and column are integer index of your row and column. Also, index for first row and column is 0. Sir! I'm fun of programming… and I have a hard time analyzing the code on how to clear a jTable by pressing a Clear button in my jFrame. we need your help! 🙂 TnX…! i have problem with this line..
i am implementing this code for creatining account for bank database. 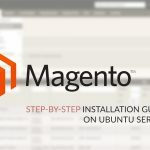 Your con object is null, check your url, username and password in the getConnection method. 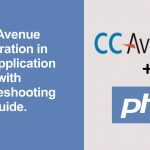 is required to load the JDBC MySQL specific drivers to memory. The JAR file containing the above driver class needs to be present in the classpath. How Get Database records and show it in the JTextfield? how can i delete data in 3 tables in one click button,the data in that 3 tables has same id no.? can you help me? i have to mention that your blogs have been particularly helpful! i need to fetch data from ms excel and place it into an oracle database. i am able to make connections to both these databases one at a time. is it possible to make multiple connections in the same code? how can i select data first and update? Hi wanna you one question. if for text field = gettext. for combo box? my coding is not showing any error but it is not getting updated.please help my exams are coming soon. sir my coding is not showing any error but it is not getting updated.please help my exams are coming near by.